Between 1980 and 1983 Dexys Midnight Runners recorded a total of four radio sessions and three live shows for the "British Broadcasting Corporation" all of which aired on BBC Radio One. For many years these rare recordings were the sole domain of collectors, courtesy of old cassette tapes recorded from the radio at the time. All in all, this body of work included high-quality recordings of over fifty Dexys songs - many of them performed in styles very different to the familiar versions. It would not be until 1993 - when an incomplete recording of the live broadcast from Newcastle was issued as "BBC RADIO ONE LIVE IN CONCERT" - that the first CD featuring any of these performances was officially released. This was followed two years later by the "RADIO 1 SESSIONS" compilation which, curiously, featured just 8 of the 16 available tracks. Since then most of the remaining recordings have come out in dribs and drabs as part of various compilations and album re-issues. The only BBC recording which remains completely unreleased is a "Live In Concert" performance from Liverpool dating from March 1983. None of these tracks featured at all on the "RADIO 1 SESSIONS" CD, with only one selection from 1980 (out of a possible eight) deemed worthy of inclusion by Kevin Rowland who personally selected the recordings for that release. The recording of "Respect" finally found its way onto CD with the 1996 compilation "IT WAS LIKE THIS", but it was not until 2010 that all of the tracks gained a release on the "SEARCHING FOR THE YOUNG SOUL REBELS - 30th ANNIVERSARY EDITION". The earliest known recording of "Geno" is note-worthy as being the only released version to include the extended introduction incorporating Geno Washington's "I Gotta Hold Onto My Love" which was a regular part of live performances of the song. Only "Tell Me When My Light Turns Green" made the cut when the "RADIO 1 SESSIONS" CD was released in 1995, leaving a fifteen year wait for the remaining tracks to gain release - again on the excellent "SEARCHING FOR THE YOUNG SOUL REBELS - 30th ANNIVERSARY EDITION". The recordings of "Geno" and "Breakin' Down The Walls Of Heartache" are both very similar to the single versions, having been recorded within weeks of each other. "Tell Me When My Light Turns Green" represents a slightly earlier incarnation of that song - missing out the break-down section featured on the later album version. This concert - a popular bootleg amongst fans for many years - was eventually released on CD in 2007 as part of the "PROJECTED PASSION REVUE" retrospective collection. The released version has the bonus of including "Breakin' Down The Walls Of Heartache" - absent from the original radio broadcast and, therefore, the bootleg tapes also. However, somewhat bizarrely, the start of "Soon" is missing from the released version even though it IS on the bootleg recordings of the radio broadcast! For anyone not lucky enough to have witnessed the 1981 line-up in action the concert gives a good indication of the power and "passion" of their performances. The only one of Dexys' four Radio One Sessions to feature in its entirety on the "RADIO 1 SESSIONS" CD - a reflection not only of the quality of the music but also of Kevin Rowland's obvious desire at the time to shine some light on the "Projected Passion Revue" era. Very much a transitional period for the group, the session is of interest for the fact that it provides early, pre-violin versions of three songs which would later feature on "Too Rye Ay" and, also, that two of the numbers had yet to find their eventual titles at the time of recording. Perversely, the "PROJECTED PASSION REVUE" CD which followed 12 years later, omitted the recording of "Spiritual Passion" meaning that in order to own the complete 1981 recordings on CD you would need to buy both releases! Recorded at a truly pivotal moment in the story of Dexys Midnight Runners, this live show was first released on CD (without its closing number, "I'll Show You") in 1993 on the "BBC RADIO ONE LIVE IN CONCERT " CD. Featuring the same line-up which had recorded the 1981 Live In Concert - but with the addition of The Emerald Express string section and with bass player Giorgio Kilkenny having replaced Steve Wynne - this was the wider world's first exposure to Dexys' new "Celtic sound". To hear the opening bars of "Come On Eileen" greeted by a complete lack of recognition from the audience is to revisit a very specific moment in time, making this a fascinating piece of music history. The recording of "I'll Show You" was eventually reunited with the rest of the concert as part of the "TOO RYE AY - DELUXE EDITION" CD in 2007. 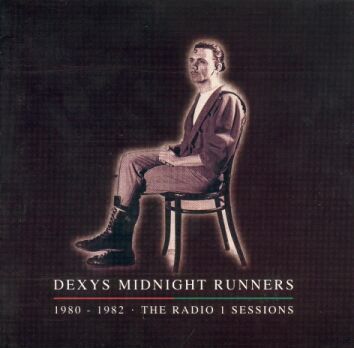 Three quarters of the tracks recorded for Dexys' 1982 Radio One session appeared on the "RADIO 1 SESSIONS" CD in 1995 but - in stark contrast to the 1981 sessions which preceded them - these were all re-recordings of material featured on the album "Too Rye Ay". Following the departures of the entire brass section - and bass player, Giorgio Kilkenny - this was a band in a state of flux with several new (and, in some cases, very temporary) recruits. The remaining recording, "Let's Make This Precious" didn't see the light of day until 2007 when it was included (along with the rest of the session recordings) on the "TOO RYE AY - DELUXE EDITION" reissue. 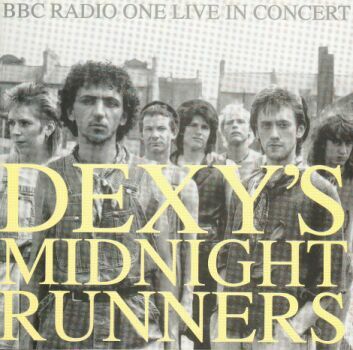 Sadly, this is the missing piece of the jigsaw as far as official releases of Dexys Midnight Runners' BBC output go. This concert, recorded as the band were coming towards the end of their extensive touring to promote "Too Rye Ay" points in the direction of the album's follow-up with elongated renditions of songs, featuring numerous set-piece monologues and conversations. Frustratingly, the radio recordings which do exist feature an interrupted slow version of "There There My Dear" whilst the BBC cut to a short news update. Hopefully a complete recording of the concert - perhaps with additional songs not broadcast at the time - will gain a CD release one day. Prior to the start of the concert, Kevin Rowland was interviewed by David "Kid" Jensen, a recording of which can be found on the Interview In-Dex page. See: Albums Discography for more details on the CD releases listed above. See: I'm Just Looking for details of Dexys Midnight Runners BBC TV performances.